Download and print our templates (be sure the Adobe Reader's page scaling setting is set to none); then cut out each one along the solid lines. The PDF file may contain several sizes; print the page that has the one you need. 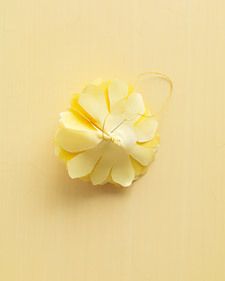 We use the smallest peony template and the largest rose template to make the bridesmaid corsages. We used the largest template to make the oversize peony worn in the bride's hair. It can be downloaded two ways: One version prints on 11-by-17-inch paper; if your home printer won't print on paper that large, you can take the image on a disk or thumb drive to any copy shop. The alternate version prints on two pieces of 8 1/2-by-11-inch paper; cut out each template, and then overlap them at the shaded areas and tape together. 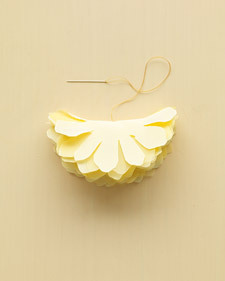 Use the stencil to cut out 9 to 17 layers of fabric (the bigger your flower, the more layers you'll need). Stagger the layers on top of one another and sew them together by stitching a few times through the center of the stack. Fold the stack in half top to bottom, then fold it again side to side. Sew three or four stitches along the open seam, just enough to anchor the fold. Arrange the petals as you like with your fingers.